If you spend your days hiring people across different teams or buried deep in global recruitment campaigns, we’ve just added your dream feature: User Permissions. For people on a paid account, the ability to add multiple users to your Weirdly account has been awesome. It means your hiring team can collaborate on candidate reviews – adding notes to profiles and managing long-and-short lists. This new permissions feature is now taking that to the next level. In a nutshell, Weirdly’s new user permissions will allow you to grant (and block) user access to different quizzes on your account. This is great if your Weirdly team includes hiring managers who should only have access to the quizzes that related to their own teams or office locations. It will also allow you to control which team members can perform different tasks on your account. “Groups” are the way you can organise your quizzes into clusters. For example, if you’re a cafe with a whole lot of different locations, you may like to set up a group for each one: New York (for your NY office), Auckland (for your NZ office) and Disneyland (for the coffee cart just next to SpaceMountain). If you’re a business that hires lots of people in different departments or teams, you could make groups like “Call centre”, “Digital team” or “Marketing”. What you call your groups is entirely up to you. You can change these at any time, and there’s no limit to the number you can create. Inviting users to your account has always been super-easy using the Weirdly admin panel. Now once they’ve joined, you can select which groups your new team members can access. This means when they login to the Weirdly account, they will only see quizzes that are in that group. It’s important to note, when a new user joins your team, their default group access is set to “All”. This means they can see all quizzes on your account – regardless of what group that quiz belongs to. You can change group access for anyone at any time, as many times as you need to. No limitations! Impossible is nothing! Adidas would be proud of us. As well as giving your user team access to different groups, you can easily set what activities they can do in Weirdly. Just choose the option that fits that user’s role best. 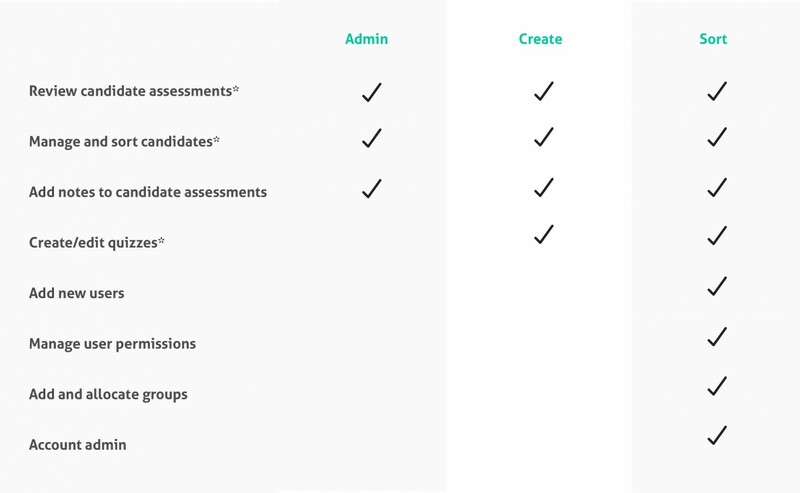 *Relates to quizzes, assessments and candidates in the groups each user has access to see. So that’s how Weirdly user permissions works. We’re keen to hear how it’s working in your team so don’t hesitate to send us your feedback – either on twitter or by dropping us line in the awesome PeoplePeople slack community. And if after all this, you’re kicking yourself for not using Weirdly in your own organisation, It’s not too late! Give a free trial a go now (it only takes 30secs to set up and we’ll build your quiz for you).